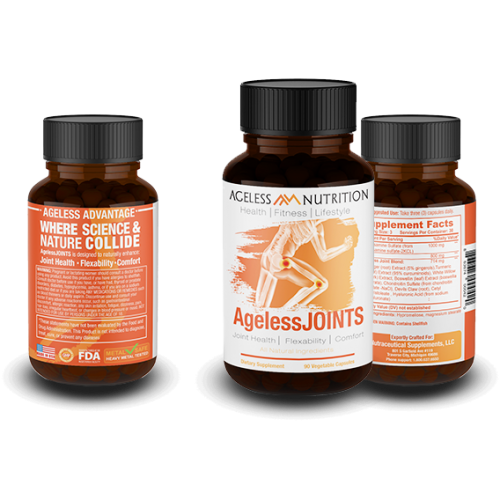 When it comes to making sure we are getting the correct balance of vitamins and minerals, we here at Ageless Nutrition have years of experience in advising our customers of the best products to take. One of our favorite supplements is Glucosamine. As we get older, so do our hips and joints, and Glucosamine is a key nutrient needed to help keep us flexible. What is Glucosamine & its benefits? Unfortunately for us, the human body has joints and muscles that deteriorate over time. In the case of muscle mass, it can be easily built back up – not so with aging joints. Glucosamine is a vital ingredient in the body rebuilding these time-worn joints and helping to preserve flexibility. Glucosamine comes in a few different forms. The type taken for aiding in weight loss is Glucosamine mixed with Chondroitin – a secondary joint building compound that both need to be present in the cartilage to rebuild and preserve joints. According to Authority Weight, this particular supplement has also shown to prevent the development of fat cells in animals. This means there is a strong correlation between prevention of fat cells building up in the body and the taking of Glucosamine. 3. Slows down the progression of HIV and AIDS. According to WebMD, there are significant indications that Glucosamine sulfate prevents or slows down the rate at which the HIV virus develops into AIDS. Unfortunately, studies have not extended beyond the petri dish as of yet, and confirmation is still a long way away. That being said sufferers taking this supplement tend to have a better quality of life and for longer. 4. Gives IBD the boot! In a recent study performed upon 12 children with severe inflammatory bowel diseases, Glucosamine was found to have a marked improvement in their health. Of the twelve eight did not require an operation to correct the problem after being given the supplement for an extended period… and some of those children had Crohn’s Disease! You can read all about the study here, courtesy of the National Library of Medicine. Interstitial Cystitis is a painful condition of the bladder that Glucosamine can treat. In its sulfate form, this supplement is naturally found as an inner lining to the bladder and urinary tract. Infections can often be a result of the depletion of this sulfate within the body. Specific Care cites the strengthening of this lining as an important tool in fighting back against infections. 6. Provides pain relief for Osteoarthritis. We turned to the experts at Arthritis.com to find out if the link between Glucosamine and the improvement of arthritis symptoms was true. They say that it benefits those with osteoarthritis of the knee, hip, lower back, and other joints. The anti-inflammatory properties stop the swelling and reduce pain associated with it, leaving you healthier all round!